Over the last few weeks I have been spending some of my free time guarding the US Armed Forces Recruiters. There is a core group of about 3 guys that are there most days, but I do try and stop by and help whenever I can. Considering how many threats they get and how crazy our world has become, these unarmed and completely vulnerable members of the Armed Forces are sitting ducks for psychos with an axe to grind. The other guys wear belt rigs, but I don’t like the way that belt rigs fit. They are uncomfortable and really pull my britches down more often then not. If something happened, I would be shooting with one hand and holding my pants with the other. The idea of tooling around a parking lot with my thigh rig also did not seem like a good choice. It is awkward enough for people not used to firearms to see people wearing them. Walking past several guys open carrying pistols to go sign your life away to the government just seemed counter intuitive as well. Probably not the best sales presentation for the military. To fit within the constraints of being comfortable, quick availability, easy carry of extra magazines, and allowing concealed carry I knew I had to do some searching. When I went down to our local sporting goods shop to search for some sort of system my choices were very slim. There were mostly belt carry or universal fit type systems. When I looked at shoulder rigs my choices were even worse. Originally, I wanted something for my M&P Shield 9 mm since it is a small form and easy to conceal. That really wasn’t an option if I wanted something that was not a universal fit. After looking at what was available, I ended up with a Galco Miami Classic Shoulder Rig for my 1911. To get it to fit nicely and comfortably you have to keep it really loose. If you get it too tight, the pistol and the mags are too tucked into your armpit and it makes quick access to either very difficult. The only way to keep the pistol from sagging is to wear a shirt with a collar. The cross piece for the straps will fit off to the pistol side a little bit, but the collar will keep it from getting too one sided. If you don’t have the collar, the mag side rides up your neck and gets uncomfortable. Practice drawing so that you get things adjusted properly. I have had to redo the adjustments and how my 1911 rides multiple times to get it all set up properly. The shoulder rig is much easier to draw from more positions than a belt rig. Sitting in a car, wearing certain clothes or coats, etc., can make a shoulder rig the only viable option for concealed carry. At least that is how it works for me. If you can carry a full sized Glock down your pants and still draw it while driving your car then go for it. It WON’T work for me. Maybe other people the size of a small black bear will benefit from my experiences. The quality of the Galco products is truly amazing. They do a great form and fit to the pistol that keeps it nice and snug. You will not get this same fit with a universal type rig and I am not that partial to Velcro closures. The fit of the leather and snaps make me very happy in comparison to the multiple universal fit holsters I have used in the past. Just be aware that these rigs are not cheap. You will pay a premium for them. Mine cost me around $165 at a brick and mortar location. They can be found for around $150, but I needed mine quickly so I was not carrying a pistol around in my pocket to protect recruiters. 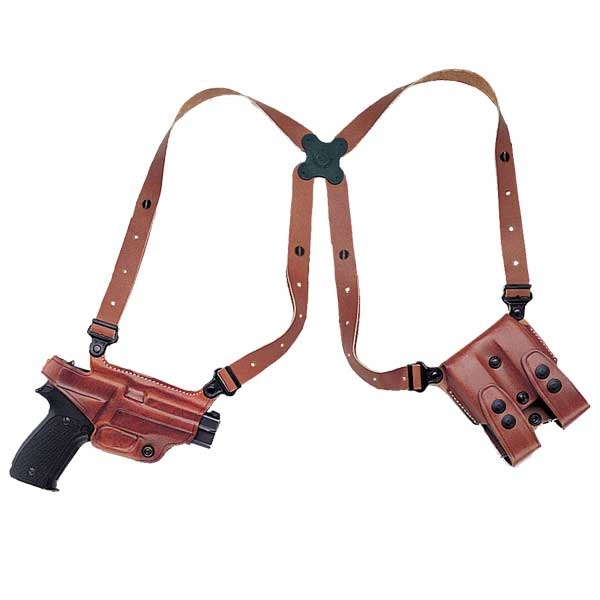 Again, I have found that this allows me to easily carry while driving that waist carry options did not afford me. Crazy as it sounds, my carry gun of late has been a full sized ParaOrdinance 1911. It is even quite concealed with baggy clothing. I have also taken to wearing it around the house because it just dangles and moves right there with me. For anyone thinking about a shoulder rig, I really recommend Galco’s line. You would have a hard time finding anything better made or designed at even twice the price. This entry was posted in Firearms, Miscellaneous and tagged carry holsters, carry rigs, concealed carry, concealed holsters, Galco, Galco holsters, holsters, shoulder holsters, shoulder rigs on November 23, 2015 by Woodsbum.